Literacy is the ability to identify, understand, interpret, create, communicate, compute and use printed and written materials associated with varying contexts. Literacy involves a continuum of learning to enable an individual to achieve his or her goals, to develop his or her knowledge and potential, and to participate fully in the wider society. How can I identify if my learner has literacy needs? There are a variety of factors that may contribute to why ESL learners may not be functionally literate. They may come from countries where unrest, war or other factors have interrupted their learning, or where their access to education may have been restricted. Depending on how much education they have received, learners may be preliterate, non-literate, or semi-literate. ESL learners with less than ten years of education or with disrupted education are likely to have literacy needs and require support to develop skills and strategies usually acquired through formal education. ESL learners with three years or less of education require extensive instruction, guidance, and support in an ESL program. Why is Digital Numeracy important? computer, a mobile phone, and Internet technology. The ability to critically understand digital media content and applications. The knowledge and capacity to create with digital technology. 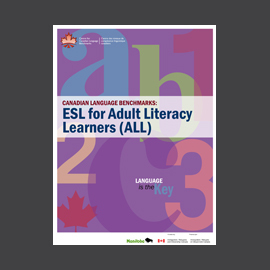 What is the difference between an adult ESL learner and an adult ESL literacy learner? The key assumption is that ESL Literacy learners work toward the same language outcomes as literate ESL learners, but their learning does not progress as quickly because they lack transferable literacy concepts, knowledge, and strategies from their first language; they are working on both language and literacy at the same time. It is critically important to identify ESL Literacy learners at the point of entry to programs and to carefully diagnose individual strengths, weaknesses, needs, and challenges. Placement in appropriate classes is essential to their learning success. 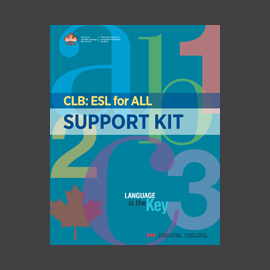 ESL Literacy learners require specialized instruction and ongoing support to address both their language and their literacy needs. These objectives are best accomplished in separate classes devoted to ESL Literacy.